This was my first National competition and I was almost not going to go due to an injury to my leg. 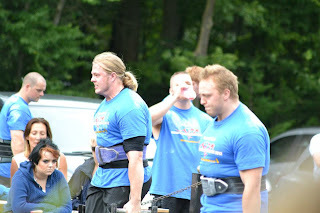 The injured caused me to have a bad run up to the competition as I was only able to train strict press and deadlift, but I decided I would still go for the experience. Unfortunately my training partner (and driver) had to change our plans on the day of travel, so I had to arrange travel plans a couple hours before we were set to go. I ended up catching 3 trains and a bus then walking to my hotel. I finally arrived at midnight dripping wet as I had been rained on. To make my weight from 109.4kg on Tuesday I had been eating just plain chicken and veg. 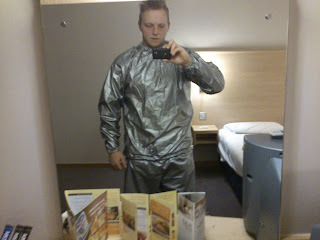 When I arrived at the hotel I weighed myself and I was 106.1kg, which worried me as I needed to be 105kg, so I sauna suited up to go to sleep (this was not a good experience) I woke up 8 times in the night in pools of sweat but knew it had to be done! The morning of the competition Richard "Sen" and his family were kind enough to drive me to the competition, by this point I had not eaten or drunk anything in 14-15 hours so wanted to weigh in as soon as possible. I got to the weigh in at around 9:30am and I weighed in at 104kg but the scales where weighing light, to get the placings for the 1st event we picked out numbers from a hat and I picked 4th. Straight after the weigh in I took Dioralyte, started eating flapjacks, energy gel's, a sausage sandwich and anything else I could find. I went up to the log and cleaned the first rep, tried to push press it twice but couldn't get it. I put it down and took a very long break. With 15 seconds left, I cleaned the log again push pressed it and ground up a rep that felt like a pb. I thought this would place me well, but later I found out 5 other competitors got no reps (all sharing 6th place) While I placed 5th, only scoring 1 point more than them. 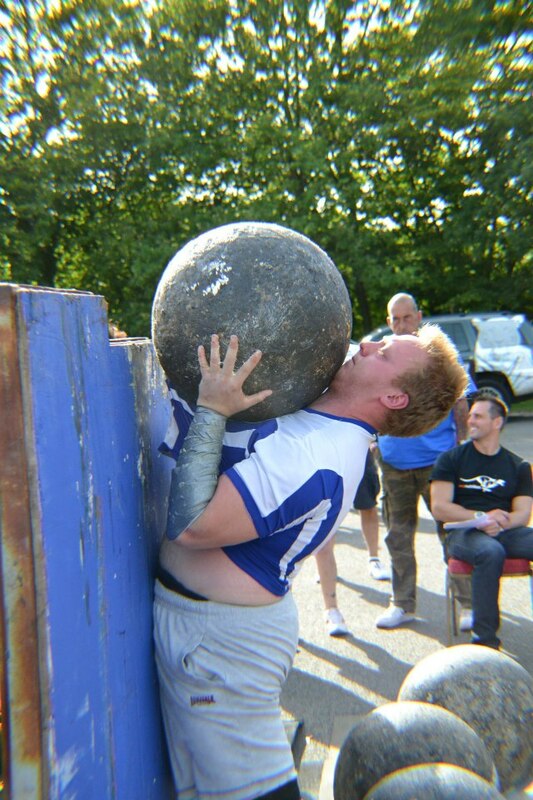 The next event was super yoke (330kg). 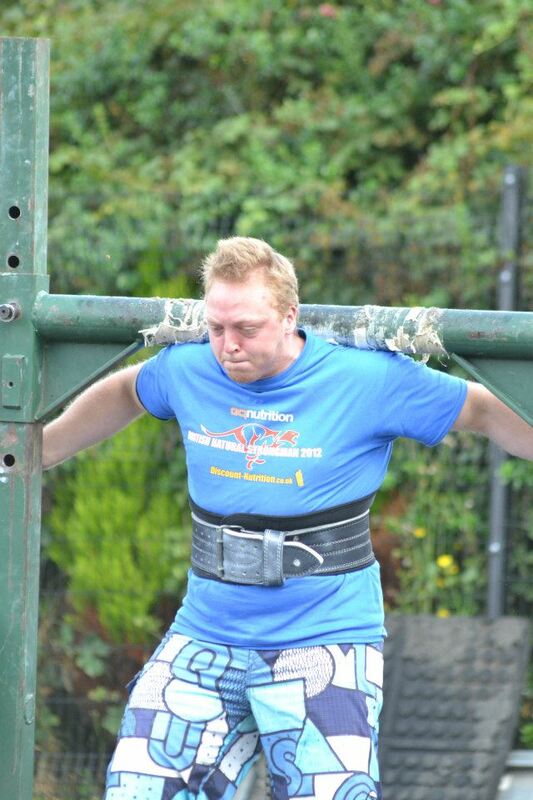 This was something that worried me, as a few days before I tried to do 200kg and my injury just wouldn’t allow it. I picked the yoke up and my core felt very stable, but with lack of leg power I just couldn't seem to move, I was going super slow and ended up going 14.5m before the time ran out, but this was a pb for me. Next event was farmers walk 130kg per hand for 20m, drop, turn, pick up and head back 20m. 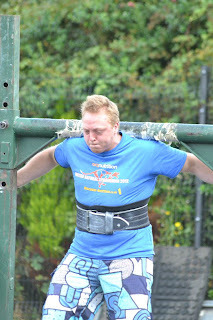 In training when I was injury free I managed 20m for a pb, so again I was worried about this event but the pickup was a lot higher than what I’m used to. I was paired with my good friend Richard "Sen" who is a beast at farmers, so I knew I had to keep up with him to do well. I picked the farmers up and went straight away, as I got to 20m and dropped them, I could hear Richard dropped his just after mine, so I quickly turned and headed up again. At this point I was in the lead and was going as fast as I could. I went over the line and to my surprise, Sen was a few seconds behind me, I think he dropped the farmers a couple meters before the line. My time was 28 seconds, again I thought that would place me well but as it turned out, the winner did 21 seconds and a few other guys placed in front of me. I think I was around 5th on this event. The final event of the day was Fingals finger. I had once practiced in training with a 6m cylinder (one I made, and was unable to flip). The competition one was around 4m and was actually shaped more like a square. Each weight category the u90kg, u105kg and opens had the same weight, but the number of reps you needed to do changed from 4 to 6 to 8. I went as fast as I could, but a few of the reps I couldn’t get it high enough on my chest which lost me time. My time in the end was 44 seconds and placed me around 7th. This was the first day over. Richard, his friend Ben, Ben’s girlfriend and I went out for food, I nailed an Indian but Richard and I were still hungry so we both went to Mo's chicken and got more food. I had a double chicken burger and mash potato which I took back to the hotel, then went to bed at 12. Woke up at 8am in the morning to a full English breakfast consisting of 3 sausages, 4 rashers of bacon, scrambled egg, toast, beans 2 muffins and a bowl of cornflakes! Then it was off to Paradise Wildlife Park for day 2, to get ready for the next 5 events. The first event of the day was wheel barrow carry, this involved picking up 3 blocks, 90-100-110kg and carrying them 10m to the wheel barrow, then wheeling it back 10m. I went as quick as I could made no mistakes and got 30 seconds, not sure how this placed me… Maybe 6th or so. 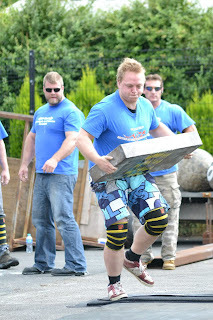 I think the next event was deadlift (250kg). I hit 5 in training so wanted more than that, I was paired with Nick who was having an awesome comp so I knew keeping up with him would be good. I set up for the deadlift wrong compared to what I’m used to but that's just something I’ll learn from. I hit 5 reps, hitched another 2 and tried to get an 8th but I didn't wait long enough to recover. I got 7 reps total which was a pb. It didn't place me very well but the standard was very high, I believe 9 reps won. Next event was anvil carry, looked brutal. 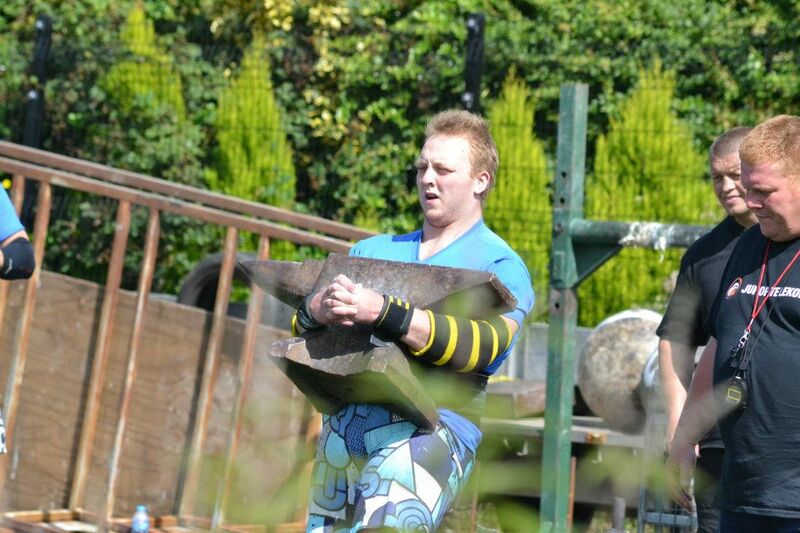 170kg for max distance, turning every 10m. I picked the anvil up and it felt light. My conditioning was good as everyone else was gassing! At 40m I turned around, still had good breath but my leg power let me down again, I got stuck at 45m and just couldn’t move my legs. The next event everyone was worried about, it was block press. 90kg for 1 point or 100kg for 3 points. 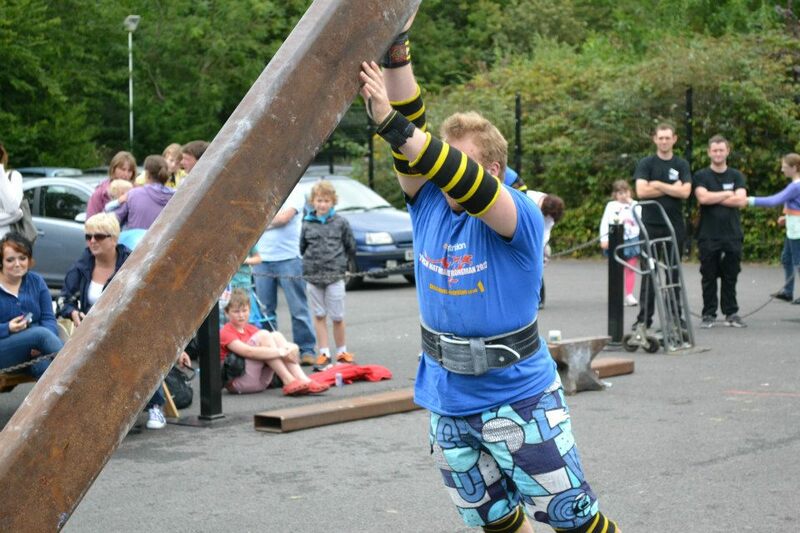 So far the best I had done was 92.5kg for 2 in training, but quite often I would fail to even get 1 rep. I was warming up with the 90kg and it felt super light, so I went for the 100kg and it was easy. I decided that would be the weight I went for. I cleaned the 100kg and pressed it very easy, but the next rep I messed up the clean, it took all of my air and I couldn't press it. I took a break, went for the 100kg again and missed it. 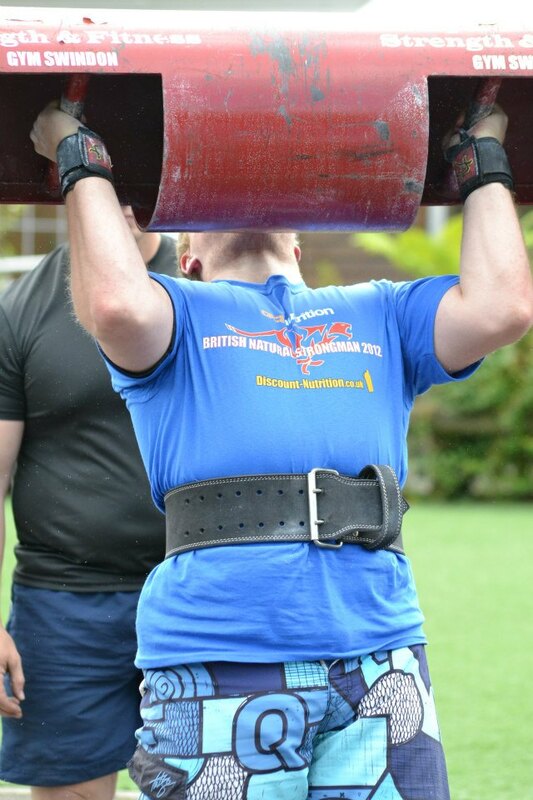 Maybe I should have gone for the 90kg… But I thought that 1 rep at 100kg (worth 3 points) beat 3 reps at 90kg but I was mistaken, so I ended up sharing points with lots of people that hit 3 reps at 90kg. 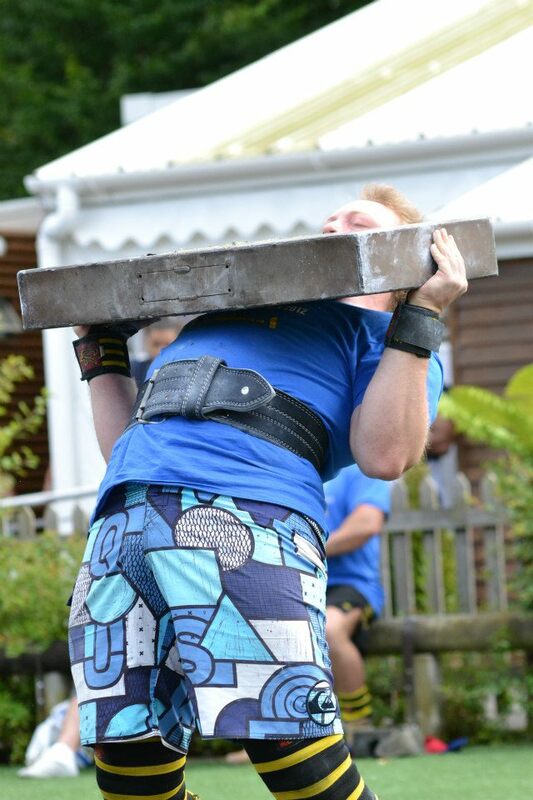 The final event was Atlas stones, 110-120-140-155kg With the platforms starting high and getting lower. Watching the u90's who had lighter stones, many of them failed to get to the first platform as it was huge (around 60inches or over) I went over to have a look and it was mid face level. I went up to do the stone, popped it up high pushed it against the platform and I was short by some distance. I went on my tip toes doing a calf raise and still couldn't roll it on! Shouldering it didn't work either, I was doing everything I could, including using my face.. I finally got the stone onto the platform having been under it for 30 seconds, went to the next stone and loaded it easily, same with the 140kg (another pb) but by the time I got to the last stone I had nothing left. I needed a break but only had 15 seconds so called it a day. I thought I’d achieved 7th place but turns out overall I made 8th place, but gaining pb’s in 8 of the 9 events I was happy… Had the no reppers been given no points I could of been as high as 6th . All in all I am very happy with my performance. The u105kg category standard was very high and I definitely have to work harder if I want to move up. Also a final note, thanks to NewSpartan Gym for taking pictures.